After having returned to India he served as parish priest of St. Augustine’s Church, Thuravoor North (1998-1999) and St. Mary’s Church, Mookkannoor (1999). From 1999 to 2000 he served as assistant director and dean of studies of Niveditha, Institute for Religious Formation and Fellowship at Chunangamvely and during the same period he was assistant at St. Joseph’s Church, Chunangamvely and in that capacity he also took care of St. Pius Xth Church, Choondy. He had been professor of systematic theology at Paurastya Vidyapitam, Kottayam, for 11 years from 2000 to 2011, of which he served for a term of three years as the Vice president of the Institute. Since 2011 he has been serving as the Syncellus (Pro-Vicar General) of the Archdiocese of Ernakulam-Angamaly. Bishop Puthenveettil is proficient in Malayalam, English and German. He is the author of the book titled ‘Priesthood: The Baptised and the Ordained. A textual Hermeneutics in the Light of the Church Documents.’ He is also the editor of the books ‘Akapporul (Malayalam-On Nicea-Constantinople Creed)’; ‘Syro-Malabar Thelogy in Context’ and ‘Paurohithyam: Uravidangal, Yadharthiyangal, Pratheeshakal (Malayalam)’. He has also some articles to his credit. On Friday, 23rd August 2013 the Synod of the Syro-Malabar Major Archiepiscopal Church, gathered at Mount St. Thomas, Kerala, having received prior Papal Assent according to CCEO can. 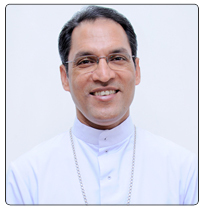 184, canonically elected to the office of Auxiliary Bishop of the Archeparchy of Ernakulam-Angamaly Rev. Fr. Jose Puthenveettil. The Holy Father Pope Francis has assigned to the new Auxiliary Bishop the Titular See of Rusubbicari. He was ordained bishop on 21 September 2013.